[Video] Why Would a Salesperson Ever Use Trailhead? Ah, sales folks. They absolutely love CRM! They completely recognize how much power Salesforce has to change their lives…from ease of opportunity management, to live and in-real-time ability for other business stakeholders to self-service any questions that they have about their book of business, to mobile ease of access. Oh, I could go on, but I’ll let my salespeople do it! They are never on their pipeline calls answering the inevitable plea from the VP of Sales to update their stages and close dates. They never need me to Chatter at them that there is no way with a twelve-month sales cycle it’s actually impossible to have a close date for next week with a 10% probability. And they love learning – one of them even knew about Trailhead before I did! Whoops. That’s just…not true. And Tom doesn’t allow us to be anything but honest here! 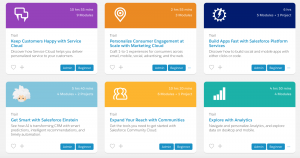 So, how can you get your salespeople to spend even MORE time with Salesforce…on Trailhead, learning even more about the system? As an #awesomeadmin, you can do this. You can show them the way, and the how, and the why to learn with Trailhead. You have to start with the WIIFM – what’s in it for me, your sales team? Well – for starters, some salespeople are actually lifelong learners. They have a natural curiosity. And, many of them don’t get the same corporate training as members of other teams; they’re generating revenue when they are out in the field and not in the office. So – if you can show them a way that they can learn and work on themselves, for free, and even on mobile for when they’re in the security line in the airport, those ones will be hooked! In this video, I showed my sales folks how to access Trailhead as a business user. It’s fun, it’s free, and it will definitely improve your business users’ work and life! I love the Drucker School MBA Essentials trail – what’s your favorite?